From the kitchen of One Perfect Bite...The days are getting shorter and nights here are cool enough to warrant bringing down comforters out of storage. That's a sure sign that its time to start working heavier food back into our diet. I do it by stages because I hate to let go of summer and its easy meals. Light soups, such as this one, appear on the table long before the heavier winter varieties are moved back into my recipe rotation. I came on this version of risi e bisi several weeks ago while doing some research on Lidia Bastianich for my blog. I have a simpler version of the soup that I make several times a year. I wanted to compare her version to my old standby, so, I did a side by side test of the two. To no one's surprise, her soup edged mine out. 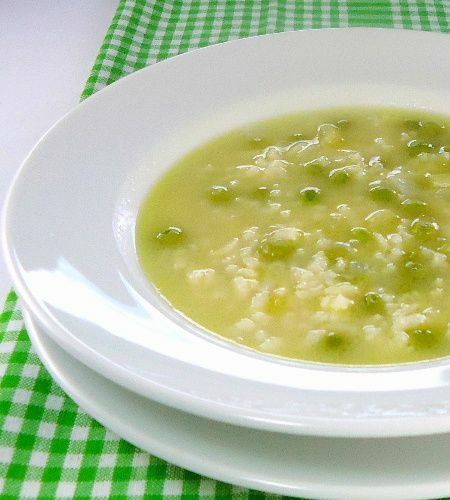 Both recipes are lovely, but my version is more like a risotto than a soup and it lacks the depth of flavor that the butter and celery give to hers. This is a really nice recipe. If you are looking for a light soup, I hope you'll consider this. It really is delicious. Here's the recipe..
1) Heat olive oil and butter in a 4 to 5-quart pot over medium heat until butter is foaming. Stir in onions and cook, stirring, until light golden, about 8 minutes. Add garlic and cook until golden, 1 to 2 minutes. 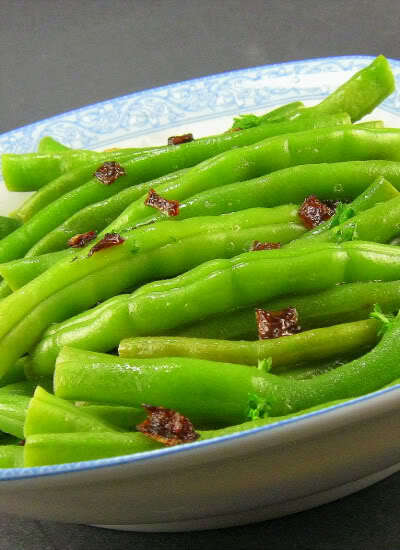 Stir in peas and celery, season vegetables lightly with salt and pepper and cook, stirring occasionally, until peas are softened, about 5 minutes. Add chicken stock and bring to a boil over high heat. 2) Adjust heat to simmering and cook until peas and vegetables are very tender, about 20 minutes. 4) Remove soup from the heat and check seasonings, remembering cheese will add a little saltiness. Stir in grated cheese and serve immediately. Yield: 6 servings. I'm definitely trying this one out - it sounds like the flavour of a risotto, but with the lightness of a soup. Lovely for spring or autumn. What a lovely soup! Love the addition of celery- This recipe goes on my list to try :)Beautiful click, Mary! Me encanta este tipo de sopas!! Peter and I are great fans of Lidia. We watch an episode of her show almost every day. This soup is so beautiful to look at! I'll it tastes just as good. This looks great Mary! Much lighter than the traditional pea soup (which I also like.) and the rice and parmesan cheese give it a nice twist. This light soup will surely please me. It's perfect for this time of year! This is such a lovely soup and looks so simple. Maria thank you very much for your visit and your words about my work. Me too I like your site. Regards. hot to day, but starting Monday, forecast has high in 60's... Soup season is on us!!! Have you ever done a basic - How to make stock post??? This would be perfect for today! I'm not feeling so well and the weather is a little cooler!! How perfect. Just this morning I was noting a surplus of peas in the freezer and thinking I needed to use some up this weekend. Cool weather is most likely a long way off for us in FL, but I know my family would enjoy this soup! As we move into temps where the high is 70 (Very nice, thank-you) this is perfect for the cooling eves. Without being over-carbed and over-bearing. Leave it to Lidia! Just got around to reading the recipe in detail. There is one thing I would do differently. The Italians like their vegetables quite thoroughly cooked I would add the rice, peas and celery all at once. Even at that, something approaching 20 minutes of cooking for the rice is perhaps too long for the peas. It might be best to thaw the peas and stir them in when the rice is done. Just from your photo I can tell this will be delicious and it's definitely going on my "to try" list. Probably sooner rather than later, even. I'm not familiar with Lidia B. but am going to check her out, for sure. Hope you have a wonderful weekend. This soup sounds delicious. I have always thought that soup "warms the stomach" to prepare it for the meal. Lidia is one of my favorite chefs. I will try this soup and then call out..."tutti a tavola a mangiare!" I'm definitely going to miss summer food...but I'm also getting excited for fall! This is the perfect transition food! This looks just wonderful! I could eat it all by itself, bowl after bowl! I love your blog..full delicious recips..congratulations!!! The soup looks so nice - always enjoy watching Lidia in the kitchen! We love soups at our house - living in the Northwoods just seems to say - comfort! Your photos are so classically elegant - very nicely done. Thank you for visiting earlier and commenting - your kind thoughts are so appreciated. I am a huge fan of Lidia's. Thanks so much for passing this recipe on to us. I'll be making this soon. mmm, this warmed my belly just looking at the pictures. i love the flavors in the soup! Sounds yummy. I have lots of rice- a perfect idea for me. 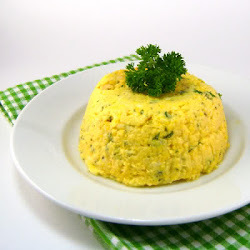 Hi there - Thanks for sharing this wonderful recipe. It was absolutely delicious. I featured it today on my What to Cook Wednesday post. I hope you will stop by and check it out! Lidia'srecipes never let me down. Thi is a great soup for our coming wintery nights.